Discover the wonders of the mangrove ecosystem. You will be in a river called Paquita and float along the streams in a deciduous forest sweet. This tour takes you through the natural channels and offers an ideal opportunity to see species of herons, kingfishers, ospreys, and other migratory birds. You will see the island, tunnels growth natural wood material. This tour takes you through the water for about 2 hours, and 15 minutes, the lunch can be arranged before or after the kayaks are an available trip — the IFOR 1 or 2 passengers. Children must be at least eight years of paddling alone. 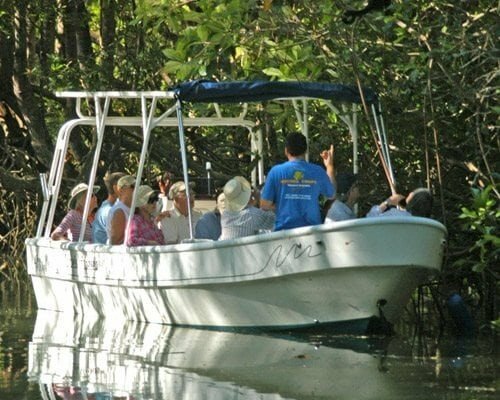 This circuit allows you to navigate through the wonders of the mangrove ecosystem. You navigate by boat, where you can interact with the monkeys also through natural channels and offers an ideal opportunity to see species of herons, kingfishers, birds, and other migratory birds. Lunch will be served after the vessel returns.